If you have an active call and need to transfer the call to someone else, touch the menu in the lower right and touch Transfer. You can then choose whether to transfer the call to one of your contacts, enter a phone number to call or choose an entry from your call history. Choosing a Contact will allow you to choose what number in that contact’s details to transfer to. If that contact’s profile has multiple numbers to reach them, they will be listed here, so just choose the number you want to use. You can then either keep the original caller on hold while you talk to the person you are transferring or just transfer the caller to that person. Your call session will then end. You can also transfer a caller to a contact’s voicemail by entering *55 followed by their extension in the dial pad, then selecting to Transfer to that number. 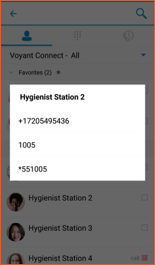 If you search for a contact and you have used one of the number entries to add a transfer to voicemail number in that user’s profile, that number should show in the list of choices to transfer to when you choose that contact. 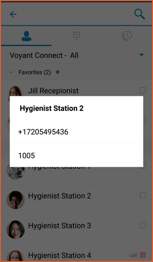 In the above, touch the last *55 entry and choose Transfer To… from the next menu to send that call directly to a user’s voicemail.